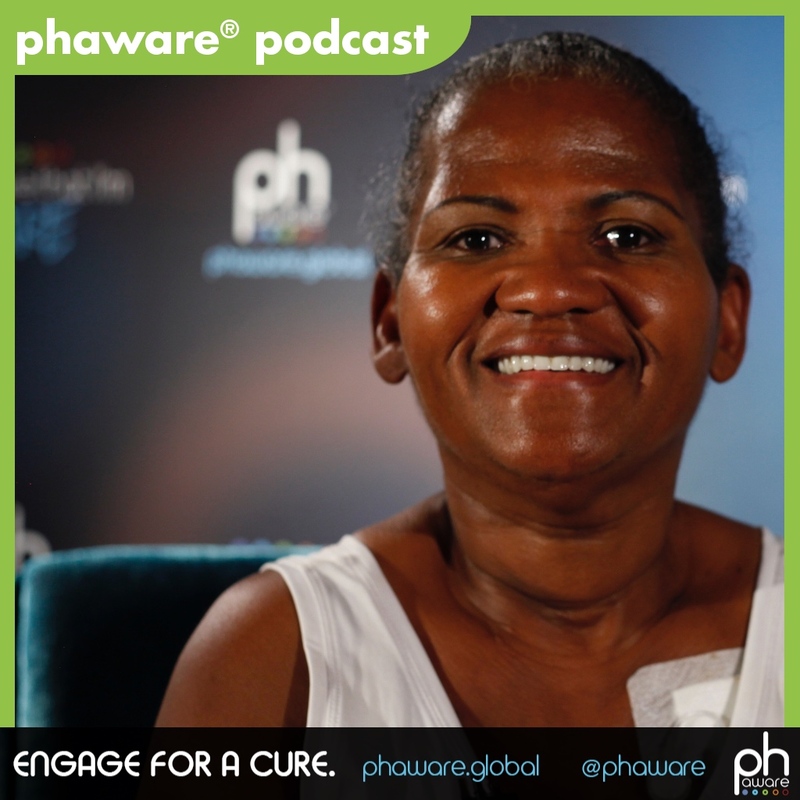 Hi, my name is Gwendolyn R. Brown, and I am a 40 year survivor with pulmonary hypertension. When I was diagnosed at that time, there was nothing out there. For three years prior, I was getting sick, I thought it was a cold. And I kept going to the doctor, and then they diagnosed me with asthma. The asthma medication wasn’t working, and it started getting worse and worse. I started passing out. And my last time I passed out, I remember waking up in the ICU and there was this one doctor there. And he was like, "I think you have this disease. It's a rare disease, but I need to find out." Back then, they didn't do right heart catheterization, they did lung biopsies. So, I had to have a lung biopsy done, and when he came back, he said, "You have pulmonary hypertension." He said, "It's a very rare lung disease." He said, "We don't even know nothing about it right now." He said, "All I can tell you is go home and get your life in order." He said, "I don't expect you to live two years with this." And I did, I went home and got my life in order. I did research, and I just took care of myself. I ate healthy, I lost the weight, and walked every day. I did everything my doctor told me to do. And that lasted until 1998, when Flolan came out, and I was picked as one of the trials to go try it out at Duke University. And that's where I met the great Dr. Victor Tapson. He introduced me to Flolan, and from then on it was amazing. I think [clinical trials] are important for patients, because even though the trial might not help me, it can help someone else. With the disease being as rare as it was, I put my name down for every trial. I am so amazed when I see all the medicine, all the treatments that are available now for people. It's just astounded me. I end up crying because it's just beautiful to see it all. But like I said, when I was coming up, there was nothing. And when they would start new trials, I was like, "I'm here. Can you help me?" And with the Flolan, at that time I was on oxygen all day. I was in a wheelchair. I was on the heart and lung transplant, because back in those days, they were only going to both lung and heart transplant. And I was like, "No, I don't want that." But then they came out with Flolan and I went and had the trial. And immediately [when I went on Flolan] I was off oxygen. So, I think trials are great for everyone to try out, and research, I don't think they should stop research. More money should be invested into it, to see if we can't cure it, at least put it in recession. Get it to stop growing. Being on 40 years of surviving and watching people, I feel amazed, I feel gifted to see it. I really do. Just to be here, to see people that I can help, that I can tell them, "You can do this, you can get through this. It don't define who you are." We all have to live through our tests and trials. I tell people, "I have PH, PH don't have me." I'm going to live my life. And I like when they say, "You lived 40 years, who do you do it?" I say, "One step at a time, with my faith. And you have to have a positive attitude, because if you sit depressed, you're going to be depressed. If you be happy, you can make it through it." And to see other people doing what they're doing, living what they're doing. I tell them do what your body says you can do. I rode a bike, I was crying on that bike ride and people thought I was going crazy. But every step. Do what you can do, what your body says you can do. But always take care of it. I think when you're first diagnosed, make sure you have a great team. And that's including your doctor, your specialist, your nurse, your caregiver. I love the movie The Lion King, because it tells you about the circle of life. And all these events go with this circle. And you end up right back where you started from at the end, and that's how I look at it with PH. It's a circle of life that we have to start with our doctors. But then eventually it comes down to us, that we take over and start taking care of us. But we keep that circle going, and I think that with a new person, listen to your doctor. Listen to your body. Hang around positive people, people that encourage you, not people to put you down. And I think that will help you be able to handle this disease and live with it. My name is Gwendolyn R. Brown, and I'm aware that I am rare.